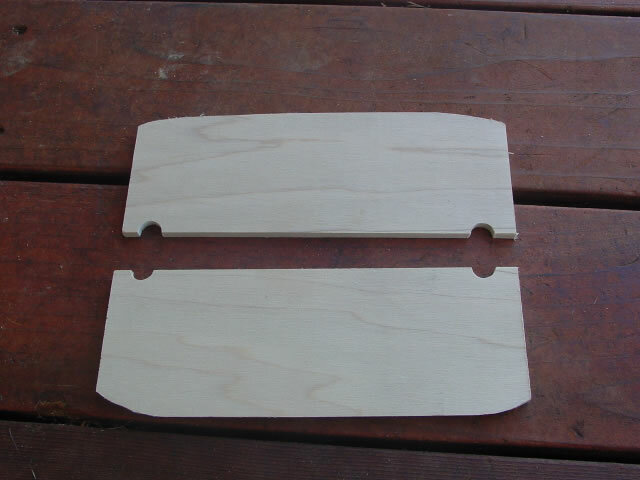 The foredeck and quarterdeck are cut from 1/8" poplar boards. They rest on top of the 5th hull layer, with the 6th layer cut vertically on the inside to leave a lip of about 1/8" around the inside. If you remembered to trace the 6th hull layer onto paper before you glued it in place, use that template for the decks. If you didn't (like me), cut cardboard or stiff paper into shape until it fits properly, then transfer the lines to the wood and cut it out. I made my initial deck pieces a little long and trimmed the front and rear edges later to fit the mast position. The main deck is made from two pieces. I used the flat edge of a board for the center joint, ensuring a clean line. 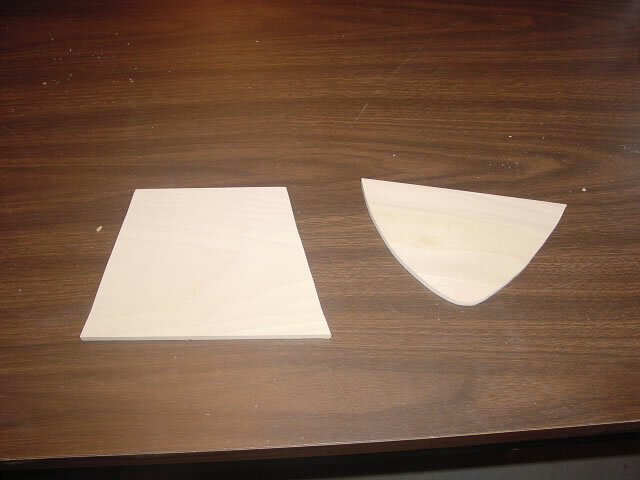 I cut and trimmed a piece of cardboard until I had the shape right, then traced it on the boards and cut them out. The edges next to the hull are angled to fit flush against the sloping hull. They are 8 1/2" long and 3 1/4" wide. The cutouts for the masts were made by hand with a coping saw. I laid each half down by itself and marked the location of the holes in the mast supports, then cut out the half circle and finally finshed them with sandpaper wrapped around a dowel.